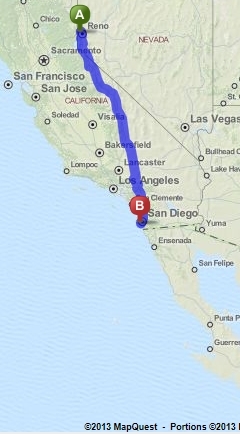 A recent comment from Rick Landers suggested I should check the first paragraph of my Bicycle Routes page where it says San Diego is East of Reno, Nevada. So I checked the facts. As you can see by the map to the left, San Diego is indeed East of Reno. This fact is part of the reason why bicycle routes across the southern portion of the United States are shorter than those starting in northern California, Oregon or Washington. Looking at the Eastern Seaboard, you can see the rest of the story. St. Augustine, Florida and Savannah, Georgia are East of Yorktown, Virginia and Bar Harbor, Maine where Adventure Cycling Association’s TransAmerica Trail and Northern Tier routes end. If you have questions about bicycle touring across the USA or cycling questions, leave a comment or send me an email.